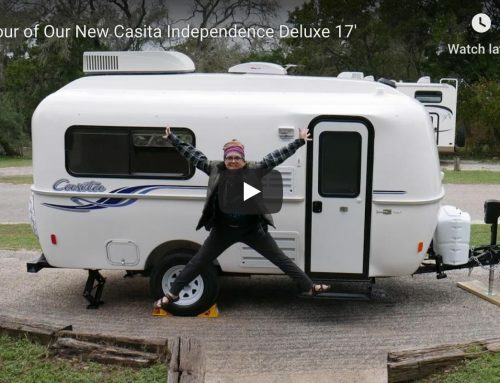 As a part of our plan to hit the Road2Retire, we are using our personal property (home, glamper camper, and Casita) to earn the funds we will need to travel full-time and save for retirement. The purpose of this post is to share our two + years of experience as successful Airbnb hosts and how you can be one, too. 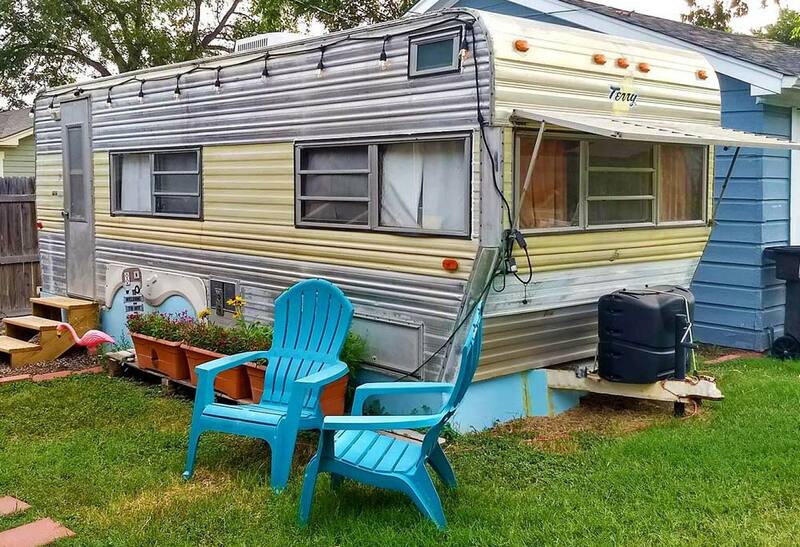 “That 70s Tow,” our little Airbnb glamper, was launched in August of 2016. 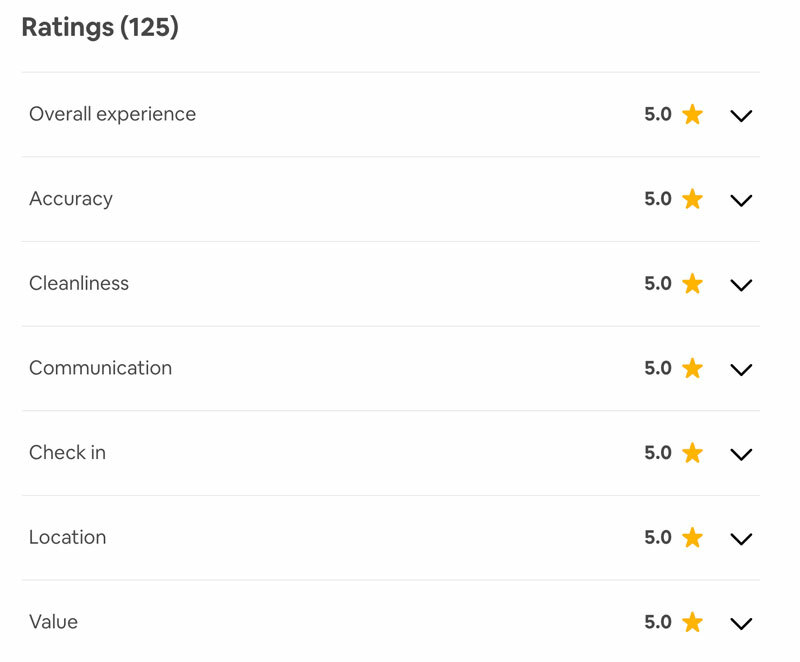 Since that time, we’ve received 126 Ratings with 99% of those ratings being 5-star reviews, and we have achieved the status of Super Host (which is no easy task). Our hard work has paid off because we average a little over $1000 each month (and sometimes over $1500). That is no small chunk of change for us. Not counting the time we spend getting supplies for the glamper or implementing new add-ons, it takes only about an hour between each guest to clean and prepare for the next. It’s not that much work. The work we do, however, is very intentional and goes towards one goal – to create an extraordinary, better-than-a-hotel experience. When creating a space to rent on Airbnb, it’s good to be aware of how you will be evaluated by your guests. A super comfortable bed with soft sheets and multiple pillow choices. I researched the heck out of mattresses, toppers, pillows, and linens and put together the perfect package! In fact, almost every guest raves about the bed, and many contact me later to find out where I got it. You can see what I buy by visiting my Stuff We Love page and look for the Airbnb Goodies. I try to order only those items that have lots of reviews by people, with very high ratings. I read both the good and the bad reviews. I ordered a California King memory foam mattress and added a pillow top mattress topper (for temperature control and comfort), and I bought the softest sheets possible. I purchased three different densities of pillows, so everyone has a pillow that is perfect for her/him. 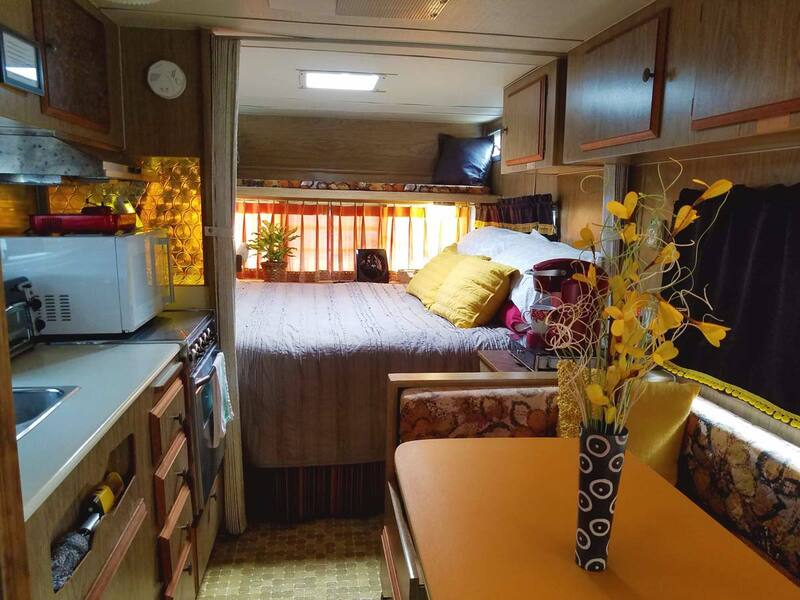 Knowing that a camping trailer had very limited hot-water capabilities, we removed the propane hot water heater and replaced it with an instant hot water that provides a shower which will never go cold. I only wish I had this in my own house, where we frequently run out of hot water during baths & showers. Soon, baby. Soon! Everything has to be dusted and/or cleaned with a natural cleaner. 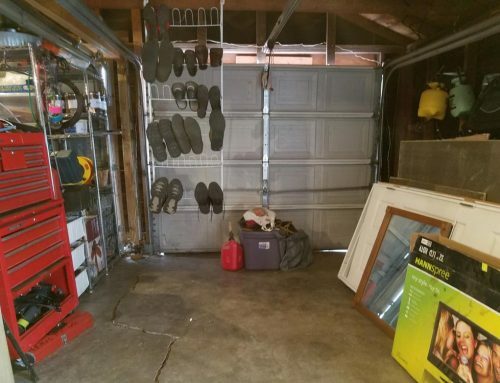 This includes not only the counters, table, and shelves, but also fixtures, books, appliances, the tv screen, speakers, and even the trash can lids. The sinks and faucets must sparkle. The bed has to be perfect and there is only one way to make it. No, I’m not crazy (well…). It’s just that the bed is accessible from only one side. The other three sides are against the walls. That means making the bed requires a serious protocol (about two pages typed, double-spaced) to ensure no part of my body gets between the sheets. In the end, the bedspread, pillows, and blanket at the foot of the bed can’t be a jumble of wrinkles as if I had just crawled all over it when in fact that’s exactly what I did. The bathroom gets extra care (including the walls around the toilet, boys) with disinfectant to ensure everything is perfectly sanitary when a guest arrives. And no hair, no hair, no hair! (After I started hosting on Airbnb, I quickly realized why the detectives on crime TV shows always took hair samples. Because everybody leaves hair, always!) If I find hair when I stay in a hotel, I get seriously wigged out realizing I have to coexist with some other guest’s residual body part. So, yeah. No hair. Rule #1. The details are what turns a great space into an exemplary one. Everything on a shelf should be carefully aligned. When towels hang next to each other, the sides the bottoms should be in perfect alignment. If a wash-cloth is draped over a towel rack or a faucet, the fold is facing forward. 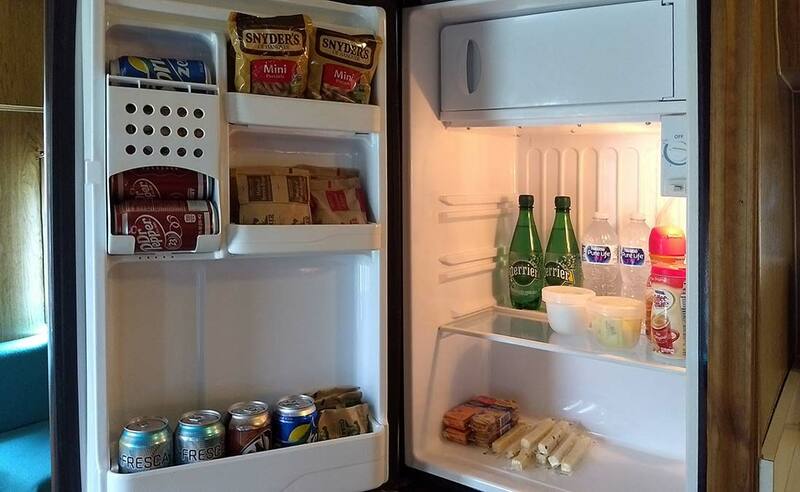 Goodies (drinks and snacks) in the fridge must have all the labels facing the front. Keurig cups are set into the tray holder with the titles aligned in the same direction for easy reading. Curtains, bedspreads, and towels need to hang straight down with no bunching or diagonals. 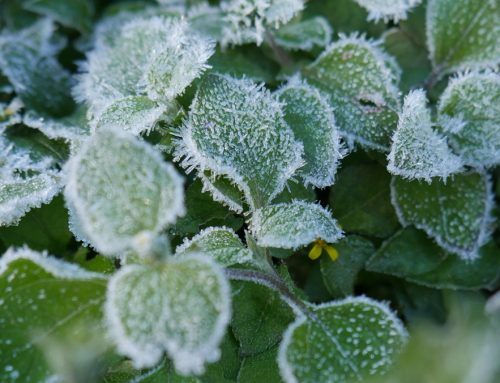 Don’t forget live plants! They do wonders for the human psyche, and they create oxygen. I know. It sounds crazy, but it’s just human psychology. Trust me. Think about every moment of your guests’ experience and let that inform you of what little extras you should offer. Is there the possibility of noise? 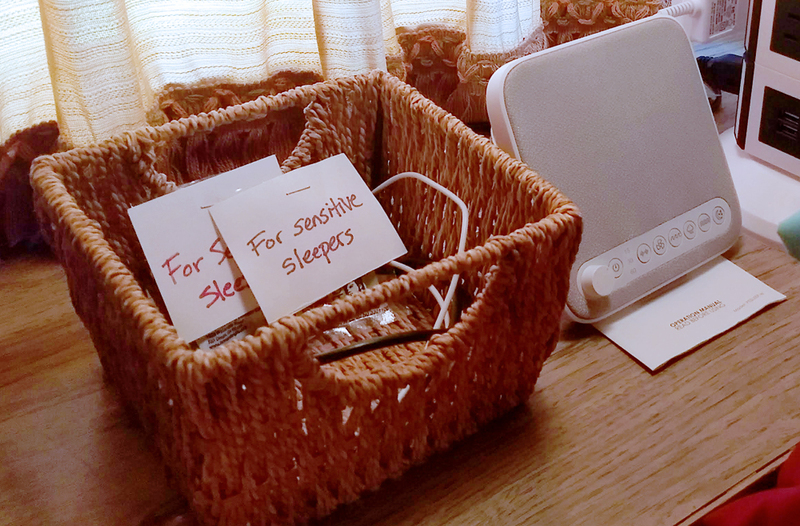 Have a white noise machine and earplugs. What do they want to do in your space? Make sure there is a comfortable place to sit and work on the computer and ensure they have high-speed internet. Offer a few interesting, yet neutral books on the shelf. Store a few games in the cabinet. Offer TV with cable/satellite and also access to Netflix, Hulu Plus, HBO Now, and music channels. After a long day traveling, will they be hungry or thirsty? Will they want coffee or tea in the morning? Provide a Keurig with regular coffee, decaf coffee, tea, and hot cocoa. Make sure to have sugar, non-sugar sweetener, and coffee creamer available. Will they want to sleep in in the morning or is there a potential for street lights to come through the windows at night? What else beyond an amazing bed, pillows, and linens would help them sleep? Have an extra yummy blanket available, and add a small fan. So many people like to sleep with a fan! Did they forget some toiletries? 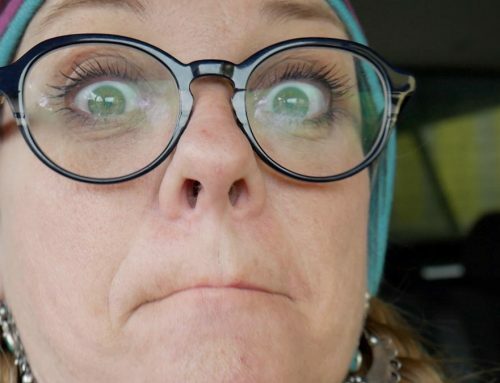 In addition to shampoo, conditioner, and body wash, provide extra toothbrushes, a razor kit, spray deodorant, dental floss, small bottles of mouthwash, bandaids, ointment, and pain reliever (because you know… hangovers happen). Will they want to prepare any of their own food? Make space for grocery storage. Provide things for guests to cook with. (We have a toaster oven, microwave, and hot plate). Make sure you have all the cookware they would need, like pots/pans, cooking utensils, a colander, and Tupperware for leftovers. Don’t forget kitchen rags, hand towels, and paper towels. It’s nice to have a wine bottle and beer bottle opener, too. Will they tire of spending time in a small space? Add outdoor living areas. 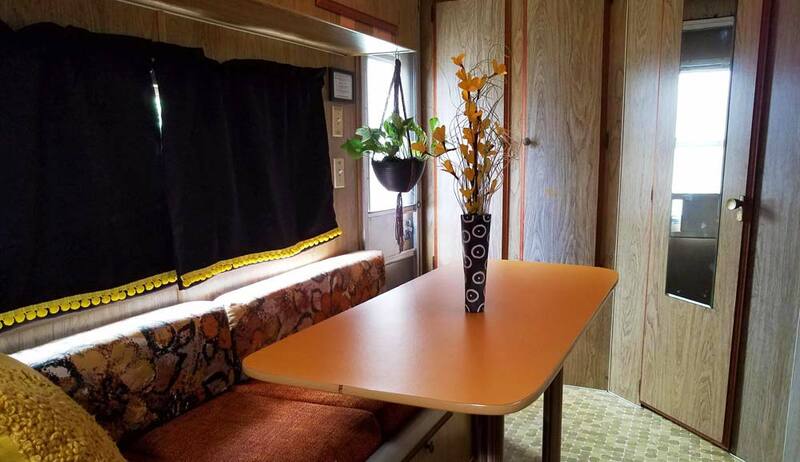 We have an outdoor covered porch (with fans in the summer and a heater in the winter) complete with comfortable seating, ashtrays, and a TV with satellite, Netflix, Hulu Plus, HBO Now, and music channels. 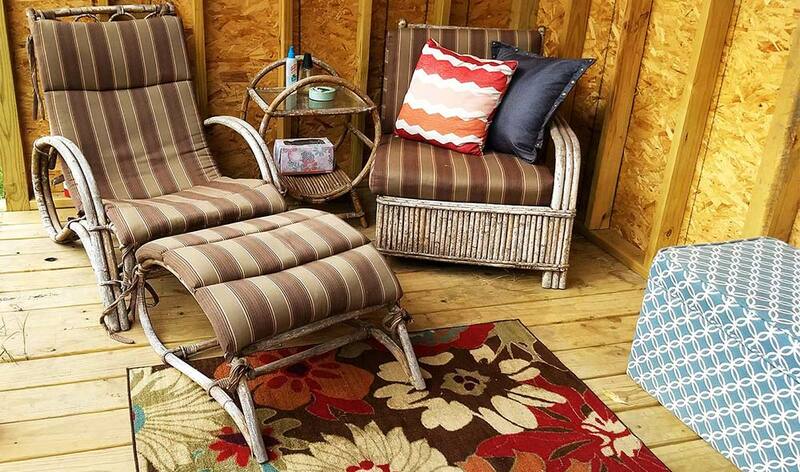 Be sure to extend a personal invitation for your guests to use your outdoor (or other communal) space. Many will feel awkward using it otherwise. We also invested in a hot tub, a great “extra” that makes our place stand out from most of the listings in our city. Let your guests know you are always trying to improve your Airbnb space and ask if they have any recommendations on what you could do or add to make it better. So much of what we offer now is because of the suggestions offered by our guests! Recommend places nearby they might enjoy. 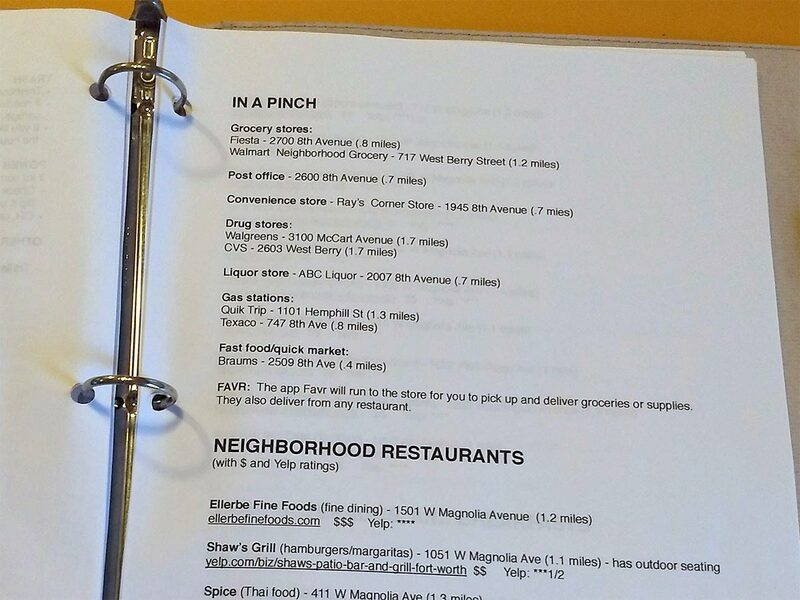 I have several pages in my guestbook about local restaurants, bars, and clubs which includes a description of the places, how far they are, what their Yelp ratings are, and how expensive they are. Provide information about nearest places for the necessities, like the closest gas station, post office, drug store, grocery store, liquor store, etc. Offer suggestions about different things to do when they are in town for entertainment. I have my recommendations divided into categories like museums, theatres, hot tourist spots, nature, parks, and more. 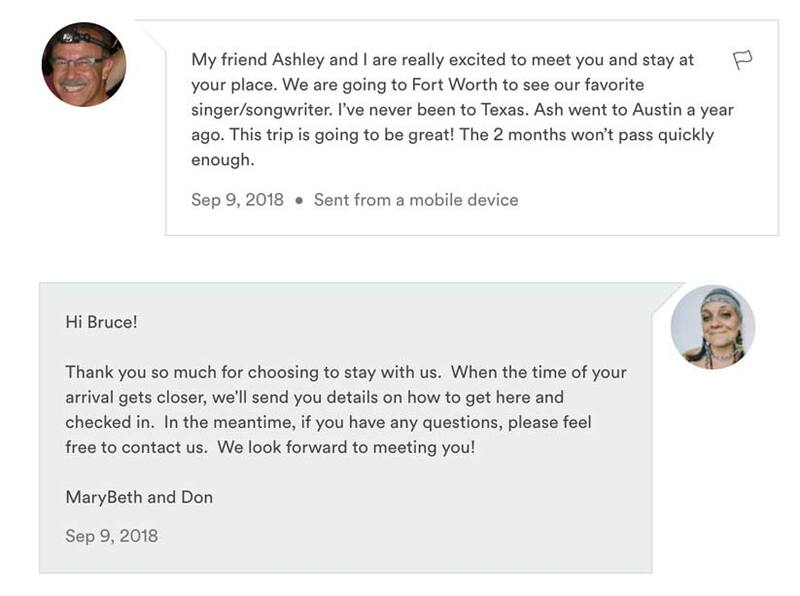 Remember, many of your guests will be new to Airbnb and good, consistent communication with them will put them at ease. I make no less than FOUR quick connections with each guest. Immediately after a guest makes a reservation. Respond thanking them for choosing to stay with us and letting them know I’ll contact them right before their arrival with check-in details. The day before their stay. Send them information about checking in and asking when they will arrive, so can be prepared. Always let guests you are always available for any needs or questions they might have. After their first night. Shoot them a message to ask how their first night was and ask if they need anything to make their stay more comfortable or if they have any questions. Sometimes, they really will have a question or request, but most often, they will share how much they appreciate you checking in with them. On the day they are leaving or the night before. I check in one last time to thank them for choosing to stay with us and give them any special instructions for checking out. People love creative spaces AND they love to contribute to them. Create a way for your guests to leave their mark. Guestbooks are a great idea, but we took it one step further to keep with our goovy vibe. We created a guestbook fence. The moment a guest enters our property, they are greeted by colorful messages left by those who came before. 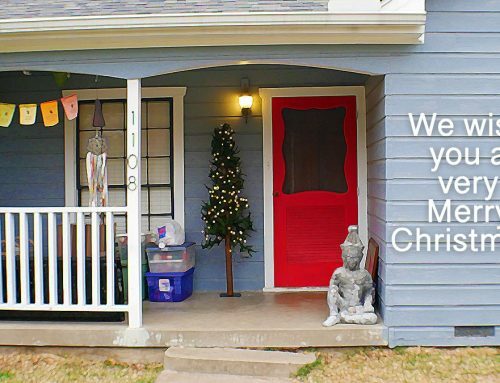 We painted our fence white, put out some Sharpies, and invited our guests to leave us a message when they check out. 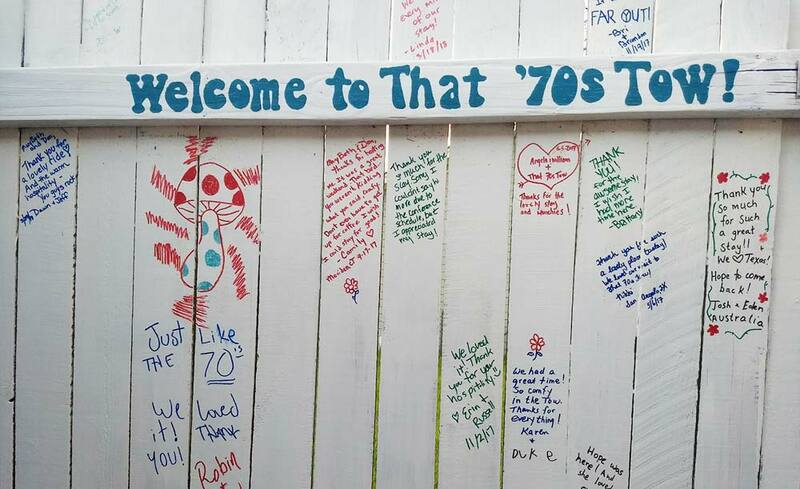 It’s so fun to see the joyful reactions of new visitors when they see our guestbook fence the first time. DO YOU WANT TO STAY IN OUR DREAMY, FUNKY GLAMPER? You can! All you need to do is make your reservation at That-70s-Tow.com. DO YOU WANT TO BECOME A HOST WITH AIRBNB? You can! 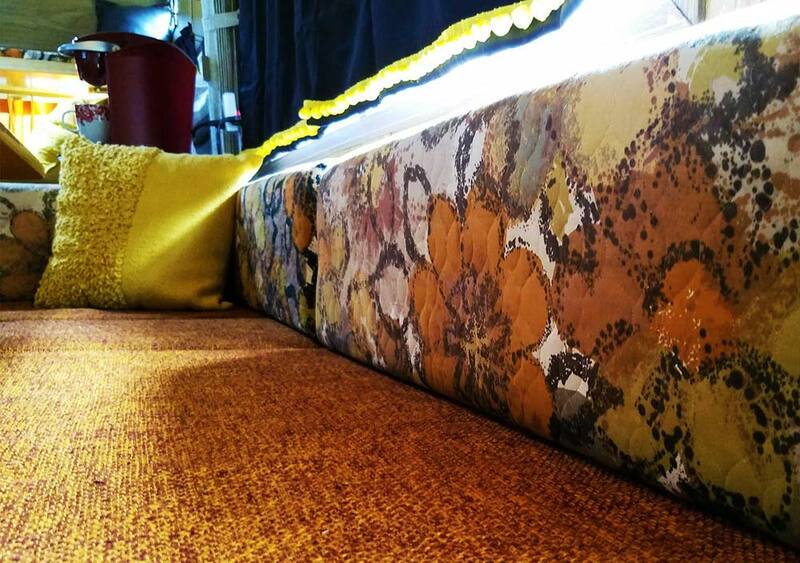 You can rent out your home, a room in your home, or a separate structure like a guest house or… you got it… a glamper! 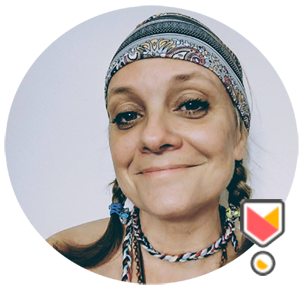 If you sign up to become an Airbnb host with my referral, I become your personal coach. That’s right. Airbnb gives me a referral fee, but in exchange, I promise to mentor you on how to create a wonderful, profitable space and help you become a 5-Star host, too. What questions do you have about becoming an Airbnb host? Post them in the comments at the bottom of the page and I’ll answer.